Please be Mispallel for Hagon HaRav Chaim Pinchas Scheinberg Shlita, the Rosh Yeshiva of Torah Or in Yerushalayim, who was hospitalized in Mount Sinai Hospital in Manhattan overnight. He exact condition is not known. Rav Scheinberg arrived just over a week ago on his annual visit to the New York area for fundraising, and to attend the dinner benefiting his Yeshiva – which was held this past Sunday. 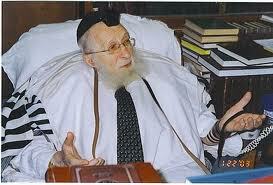 Rav Scheinberg turned 100-years-old just before Sukkos this year. The public is requested to daven for Chaim Pinchas ben Yosefa. Previous articleWhat’s Obama’s Next Move? May the godol hador have a speedy recovery. Why an earth do we see our treasured gedolim traveling round the world when some are either in poor health or are 100 years old! Why do the gaboim or yeshiva trustees allow this/ Surely this is not kovod hatora? refua shlaima to the gadol hador. He came for the annual yeshiva dinner, which was dedicated to his wife a”h of almost 70 years. He didn’t simply travel across the world fundraising. It is said about a gadol that at a cetain point he remains in this world for the benefit of the people. If a gadol just sits at home, and doesnt go out to the people, whats the point. I believe that is why R’ Steinman has also traveled around the world in recent years, despite his age. our gedolim are there for us! Rav Scheinberg’s mother’s name is pronounced Yuspuh, not as spelled Yosefa, according to what his family has told me in the past. In any case, may he have a refuah shelaimah b’soch shar cholei Yisroel.